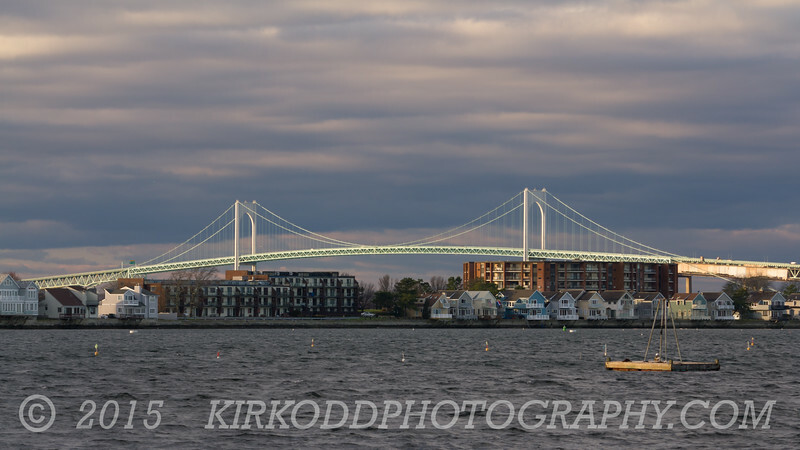 The Newport Bridge (formal name: Claiborne Pell Bridge) is a suspension bridge that spans the East Passage of the Narragansett Bay in Rhode Island. The bridge connects the City of Newport on Aquidneck Island and the Town of Jamestown on Conanicut Island. Many of Narragansett Bay's historic light houses are visible from the bridge as you drive along it. In fact, the view of the bay was breathtaking at the apex (too bad you can't stop to take a picture). On the day we took this picture, Kirsten noticed that the sun (which was just peaking through the clouds) had really lit up the green paint of the bridge, which offered excellent contrast with the heavy clouds behind it.